The user @PopPunk_PopTart tweeted the portraits to Wendy's, and Arby's jumped into the conversation. That can be a dangerous proposition because there's nothing Wendy's loves more than trolling other restaurants on Twitter. It doesn't have a reputation for playing nice. Wendy's spends more time roasting McDonald's about its frozen beef than giving high fives over roast beef, but Arby's won them over with a portrait of Wendy wearing an Arby's cowboy hat. 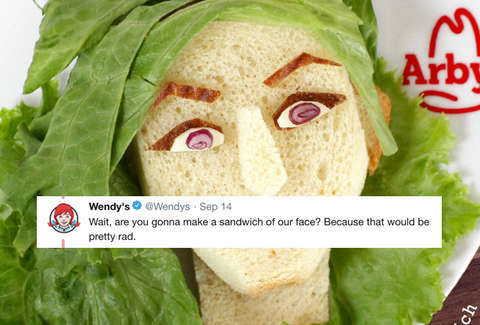 Wait, are you gonna make a sandwich of our face? Because that would be pretty rad. Here are some more of the weirdly wonderful sandwich portraits. Arby's is coming for you Subway. They've got an actual sandwich artist on staff somewhere.